Encrypt files and keep them under control! Download Prot-On and avoid information leaks, distribute books and online tutorials protecting your intellectual property, and share confidencial information securely. 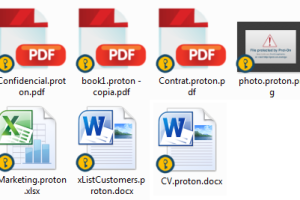 Prot-On is an application that encrypts your files and allows you to define who can or cannot read, print, edit, copy and manage them. You can assign or remove permissions at any time and with just once click, even after you have distributed the files. Encrypt PDF, MS-Office documents, images, videos, audios, texts, that you’ve uploaded to the cloud (Dropbox, Google Drive, social networks, etc…), sent by email save it on your PC, mobile device or to a USB stick. At any time you can give or remove permissions, regardless of where the files are stored. This change would be applied in real time. It´s available for Windows, Mac, Android, iOS and Blackberry. It lets you use cloud based storage (Dropbox, Gmail, Google Drive etc.) with total peace of mind. It protects your correspondence and the documents you share with clients, suppliers, collaborators, external auditors, etc. Facilitates compliance with data protection laws. Restrict access permissions to temporary workers by function and time. Gain access to information from anywhere and from any device with total security. Prot-On is a software free for home users. Control of your files now. Try It!